The scheme has only attracted about one kilogram in a month, prompting the government to nudge temples through banks to hand over their treasures, the sources said, but at least one temple said it was still unconvinced by the plan. A finance ministry official said if banks fail to win over temples, the government could intervene directly by talking to the temples as it is looking for a big boost to the scheme to keep both imports and the current account deficit under control. India’s prime minister on Thursday unveiled three state-backed plans to try to tap the stockpiles of the precious metal to trim physical demand and reduce imports by providing people with alternative avenues for investment. At an event in New Delhi, Modi announced the formal start of a gold-deposit plan, a sovereign-bond program linked to the metal’s price and introduction of locally minted coins, some bearing the face of Mahatma Gandhi. Under the gold-deposit plan, investors can deposit a minimum of 30 grams with banks to earn interest, and at maturity either redeem the gold or cash, according to a government statement in June. Banks holding the bullion will be free to sell or lend the gold to jewelers, thereby boosting supply. The planned sovereign-bond issue will be open to investors from Thursday up to Nov. 20, the Reserve Bank of India said on Nov. 3. So how is the scheme working out thus far? Not well. Not well at all. India is trying to persuade rich temples to deposit some of their gold hoards with banks to revive a plan to recycle tonnes of the precious metal and cut gold imports, sources said. The scheme has only attracted about one kilogramme in a month, prompting the government to nudge temples through banks to hand over their treasures, the sources said, but at least one temple said it was still unconvinced by the plan. In a bid to reduce the economically crippling imports, Prime Minister Narendra Modi launched the much-publicised scheme to tap a pool of more than 20,000 tonnes of gold lying idle in homes and temples. But Mumbai’s two-century-old Shree Siddhivinayak temple, which is devoted to the Hindu elephant-headed god Ganesha, said it remained unconvinced about the benefits. Modi wants temples to deposit some of this with banks, in return for interest and cash at redemption. The government would melt the gold and loan it to jewelers. Well sure. As is standard operating procedure with government, if voluntarism fails, use coercion. Despite offering slightly better interest rates than past schemes, the government is finding it difficult to break families’ attachment to their jewellery. Gold is used mainly as wedding gifts, religious donations and as an investment. “After melting, banks will deduct impurity that will cut the net weight,” said Narendra Murari Rane, chairman of the trust for the Siddhivinayak temple. 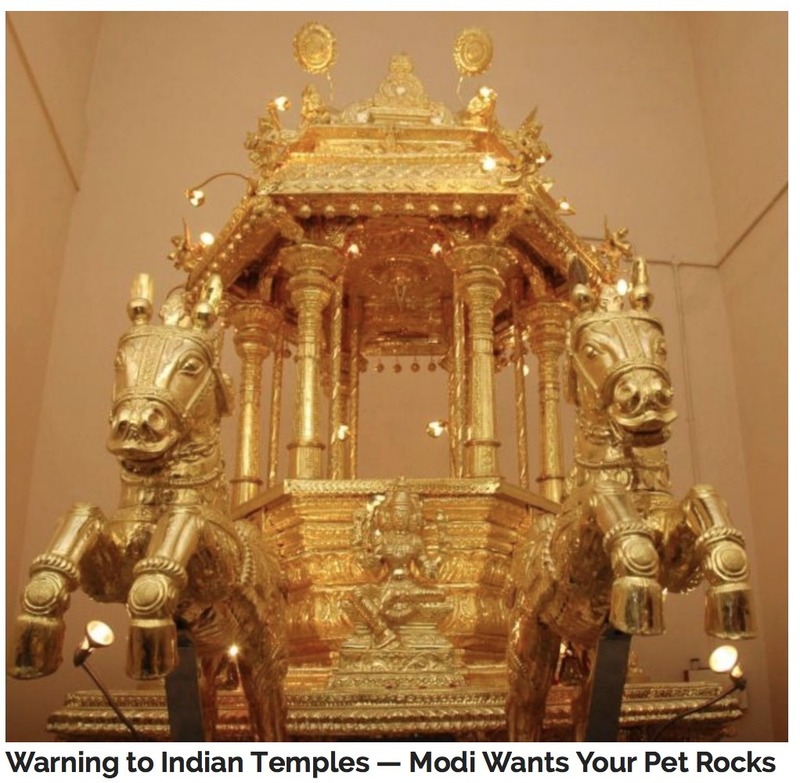 The temple, which has 160 kg of gold and is partly plated in the precious metal, is nevertheless examining the scheme. The Tirupati temple in Andhra Pradesh state will hold a meeting soon to consider participating, an official said.